Dan Gurney, born in upstate New York to artist parents, first picked up an accordion by chance in a toy store. He learned Irish music from Galway-born concertina player Father Charlie Coen. After graduating from Harvard University in 2009, he lived in Galway for a year playing with the likes of Dolores Keane, Johnny Ringo McDonagh, Mick Conneely, Ronan O’Flaherty, and Brian Mc Grath. 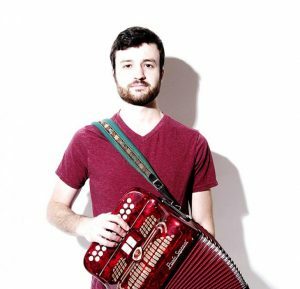 He has appeared on Public Radio International, at the International Accordion Festival, and has won nine medals at various Fleadh Cheoil music competitions. He now lives in New Paltz, NY. In this Advanced button accordion class we’ll be going over advanced techniques for the box. In addition to covering the range of ornaments, including borrowing from other instruments like pipes and fiddle, we’ll get into some new techniques that aren’t commonly used that you can add to your repertoire. We’ll learn tunes each day and go over topics like recording, performing, and developing your own style. Please feel free to bring questions and tune requests as the class will be responsive to what you’re most interested in learning. We’ll be focusing on B/C button accordion; you’re welcome to come if you have a C#/D, but most of the teaching will be oriented to B/C.